Going by the title of it, if you thought Vedigundu Murugesan was a comedy that will have you in splits, you are grossly mistaken. It is, however, in the disguise of comedy, not the one that will give you a few good laughs, the one that will make you slip into depression for having squandered your time and money. It’s not that Pasupathy cannot shoulder off the responsibility of a full-length comedy film, but just that the movie lacks a definitive subject, more so with the screenplay, dialogues, the flow and hence the performances. The movie provides some real comical relief as and when Vadivelu makes an entry. And that’s not because of Vadivelu’s clever antics; we are so used to laughing at the man that his mere screen presence is enough to stimulate a few laughs. 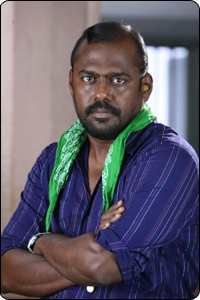 Pasupathy’s character lacks depth and it almost feels as if he’s hired to play the part of a petty criminal only for his looks. Jyothirmayi plays a police constable whose major responsibility is to transport Pasupathy to the court every time he is arrested. Love blossoms. But Pasupathy gets into further trouble and lands up in prison. Well, that’s pretty much the story. As is obvious, there is nothing much to rave about the story and ditto with the performances and the direction. Awful dialogues, in the guise of comedy only tests your patience further as you are busy stifling yawns. The Cheenichevu Sirippukaari song provides the only respite in an otherwise trite commotion of events. But then, you can always download the song onto your mobile or just watch it on TV when it’s played.